On 29th October, City’s Development and Alumni Office (DARO) and the Department of Mechanical Engineering & Aeronautics celebrated recent achievements in the Department. On 29th October, City University London’s Development and Alumni Office (DARO) and the Department of Mechanical Engineering & Aeronautics in the School of Mathematics, Computer Science and Engineering, staged an event to celebrate recent achievements within the Department. The attainments include: City’s critical role within the National Wind Tunnel Facility (NWTF), which has placed the University at the forefront of aerodynamics and fluid mechanics research; the success of four of the Department’s PhD students who made the finals of the prestigious Airbus ‘Fly Your Ideas’ 2015 competition; the appointment of Professor Christoph Bruecker to the BAE Systems Sir Richard Olver Chair in Aeronautical Engineering; and, the very recent news that undergraduate aeronautical engineering student, Jose Pellicer, was 2nd in the Royal Aeronautical Society’s (RAeS) Young Research Competition. 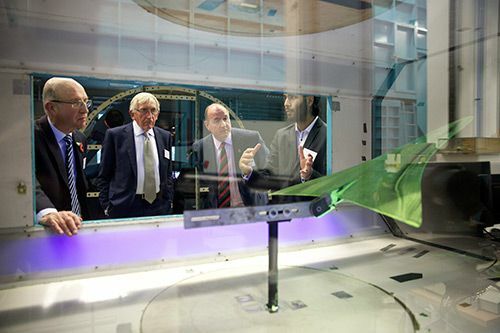 The event, which took place in the aeronautical engineering lab, was attended by over 100 external guests comprising City alumni, peers from aeronautical and engineering departments at other UK universities, members of professional bodies and research councils (including the Royal Aeronautical Society, the Engineering Council and Innovate UK), senior employees of aerospace, engineering and industrial companies, and current donors, including representatives from Livery companies and Trusts. The evening was hosted by Professor of Aeronautical Engineering, Professor Chris Atkin with special guest speaker and City alumnus, Dr Kiran Rao, Vice President of Marketing and Strategy at Airbus. “The event was a great way to celebrate the hard work of our researchers, the success achieved by our students, the support we have received from our academic and professional colleagues and the recognition and investment by our industrial sponsors: Airbus, Bombardier Aerospace and BAE Systems. The journey is by no means over, but we have made a promising start”. To view photos of the celebration, please visit this weblink. The Royal Aeronautical Society, also known as the RAeS, is a British-founded multidisciplinary professional institution dedicated to the global aerospace community. It is the oldest aeronautical society in the world. The objectives of The Royal Aeronautical Society include: to support and maintain high professional standards in aerospace disciplines; to provide a unique source of specialist information and a local forum for the exchange of ideas; and to exert influence in the interests of aerospace in the public and industrial arenas.